If you employ a reasonable system, then you should be able to quickly identify the problems plaguing a business. You won't identify the problems analyzing conversion rates, measuring engagement, or through A/B testing. You have to have a system. The file is shrinking (100,000 to 110,000 to 103,100 to 95,647). 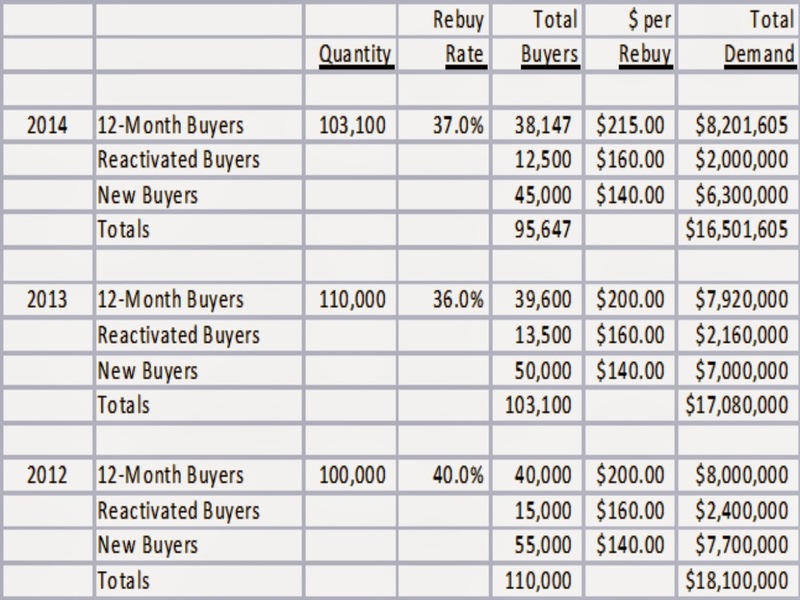 Annual demand is shrinking ($18.1 to $17.1 to $16.5 million). 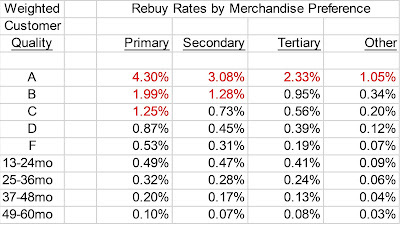 Repurchase rates are sinking (40% to 36%, then a bit of an uptick to 37%). Spend per purchaser remained constant, but then blipped up among existing customers in 2014. We can easily see that this business is struggling. 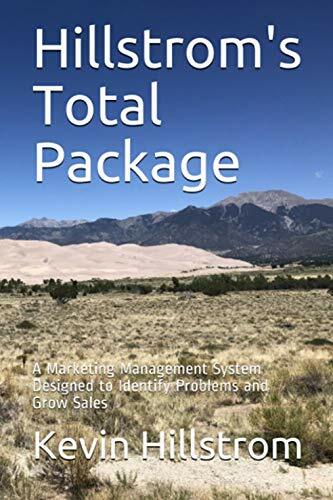 Now, clearly, Management would already know that the business is struggling, but your job is to diagnose the problem using your unique system, and your unique system is showing new customer problems (canary in the coal mine) and is showing repurchase rate problems (that's usually a symptom of a merchandising issue). We move to a comp segment analysis next. Well, the story becomes clearer, don't you think? What do you observe? All of the productivity declines are from the Kids division, which appears to have experienced an abrupt decline in items offered in the past two years - why else would productivity drop so significantly? Notice that $0 to $20 item productivity declined significantly. You can't pin this entirely on Kids, can you - just look at the dollar magnitude of the drop?! The new item column experiences a significant drop in productivity as well, while existing items actually show a modest increase in the past year. This is not a marketing issue. This is clearly an issue with the Merchandising team, specifically, their decision to cut back on Kids merchandise. 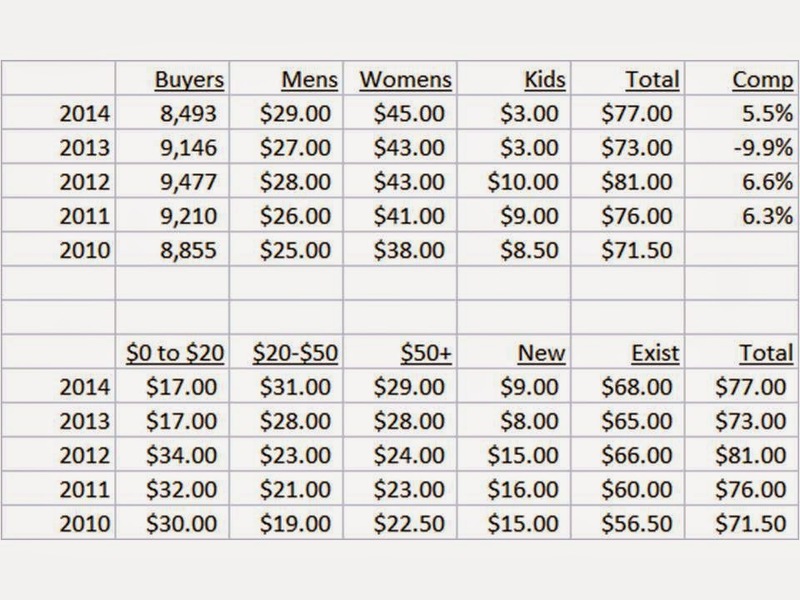 Customers did not reallocate spend into Mens / Womens, they just but back on spend, period. And the Merchandising team made a decision to cut back on inexpensive items - causing some demand to flow back into expensive items, but not enough to make up the difference. Your "system" should be able to quickly dissect the business problem. You cannot do this if you're looking at campaigns or conversion rates. You have to have a system that allows for a longitudinal view of the business.